^ Oxford University Press 2019, p. capitalism. ^ Dictionary.com 2019, p. capitalism. ^ 小学館 2019, p. 近代社会. ^ a b c d 松村 2019a, p. 資本主義. ^ a b c d e 田口 2019, p. ブルジョア革命. ^ ブリタニカ・ジャパン 2019, p. 資本主義. ^ 岸本 & 植村 2019, p. 資本主義. ^ James Augustus Henry Murray. "Capital". A New English Dictionary on Historical Principles. Oxford English Press. Vol. 2. p. 93. ^ Braudel, Fernand. The Wheels of Commerce: Civilization and Capitalism 15th–18th Century, Harper and Row, 1979, p. 237. ^ Werhane, P. H. (1994). “Adam Smith and His Legacy for Modern Capitalism”. The Review of Metaphysics (Philosophy Education Society) 47 (3). ^ a b c Macmillan Dictionary of Modern Economics, 3rd Ed., 1986, p. 54. ^ Zimbalist, Sherman and Brown, Andrew, Howard J. and Stuart (October 1988). Comparing Economic Systems: A Political-Economic Approach. Harcourt College Pub. pp. 6–7. ISBN 978-0-15-512403-5. 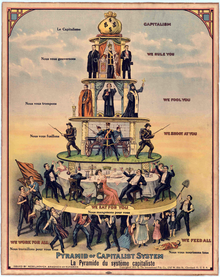 "Pure capitalism is defined as a system wherein all of the means of production (physical capital) are privately owned and run by the capitalist class for a profit, while most other people are workers who work for a salary or wage (and who do not own the capital or the product)." ^ Rosser, Mariana V. and J Barkley Jr. [要説明] (23 July 2003). Comparative Economics in a Transforming World Economy. MIT Press. pp. 7. ISBN 978-0-262-18234-8. "In capitalist economies, land and produced means of production (the capital stock) are owned by private individuals or groups of private individuals organized as firms." ^ 村田 2004, p. 74, 64. ^ a b 佐々木 2019, p. 経済的自由主義. ^ 森下 1995, p. 15. ^ Gregory and Stuart, Paul and Robert (28 February 2013). The Global Economy and its Economic Systems. South-Western College Pub. p. 41. ISBN 978-1-285-05535-0. "Capitalism is characterized by private ownership of the factors of production. Decision making is decentralized and rests with the owners of the factors of production. Their decision making is coordinated by the market, which provides the necessary information. Material incentives are used to motivate participants." ^ Gregory and Stuart, Paul and Robert (28 February 2013). The Global Economy and its Economic Systems. South-Western College Pub. p. 107. ISBN 978-1-285-05535-0. "Real-world capitalist systems are mixed, some having higher shares of public ownership than others. The mix changes when privatization or nationalization occurs. Privatization is when property that had been state-owned is transferred to private owners. Nationalization occurs when privately owned property becomes publicly owned." ^ 松村 2019c, p. 「資本主義」. ^ a b c d ブルマ & マルガリート 2006, p. 46. ^ ブルマ & マルガリート 2006, pp. 46-47. ^ a b c d e f g h ブルマ & マルガリート 2006, p. 47. ^ a b c d ブルマ & マルガリート 2006, p. 177. ^ ブルマ & マルガリート 2006, pp. 177-178. ^ a b ブルマ & マルガリート 2006, p. 178. ^ ブルマ & マルガリート 2006, pp. 94-95. ^ ブルマ & マルガリート 2006, pp. 95-96. ^ a b ブルマ & マルガリート 2006, p. 101. ^ Korstanje, M (2015). A Difficult World, examining the roots of Capitalism. New York, Nova Science. ^ Marcel van der Linden (Fall 2003). “Labour History as the History of Multitudes”. Labour / Le Travail 52: 235–44. doi:10.2307/25149390. JSTOR 25149390. オリジナルの17 December 2007時点によるアーカイブ。. https://web.archive.org/web/20071217185826/http://www.historycooperative.org:80/journals/llt/52/linden.html 2008年2月26日閲覧。. ^ Dawson, Ashley (2016). Extinction: A Radical History. OR Books. ISBN 978-1-944869-01-4. http://www.orbooks.com/catalog/extinction-by-ashley-dawson/. ^ Lavoie, Marc (Winter 2012–2013). “Financialization, neo-liberalism, and securitization”. Journal of Post Keynesian Economics 35 (2): 215–33. doi:10.2753/pke0160-3477350203. JSTOR 23469991. ^ O'Leary, Naomi, "Pope Attacks 'Tyranny' of Markets in Manifesto for Papacy". Reuters (November 2013). Retrieved 30 December 2013.